The Handbell Choir performs during the Sunday service several times throughout the year, and plays at the Sunday evening concert in December. The church is pleased to have a set of Whitechapel English handbells, by the maker of the Liberty Bell in Philadelphia. The group is open to all, from 4th grade through adult, who have some musical background, although experience playing handbells is not necessary. Rehearsals are held Thursdays at 5:00 pm. 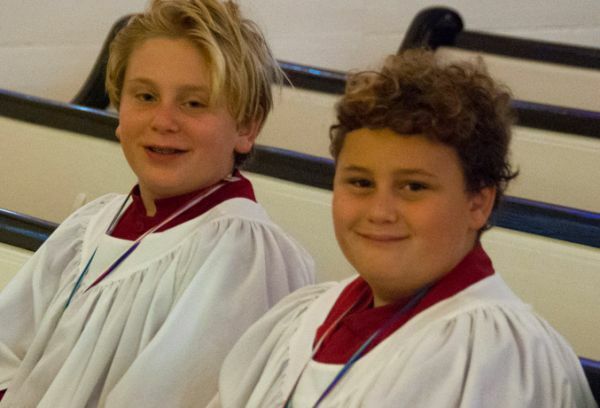 The Junior Choir is open to children from fourth grade through middle school. They rehearse Wednesdays during the school year from 4:30-5:30 p.m., and sing in church monthly. They also perform at the Sunday evening concert in December. In addition to preparing for the Sunday service, there is training in music reading and voice development. The Primary Choir is open to children from kindergarten through third grade. They rehearse at the same time as the Junior Choir, 4:30-5:30 p.m. on Wednesdays, and sing in church monthly. They learn basic musical and vocal skills, as well as find joy in singing.